If Fox does ask for Mike Tirico for TNF, should NBC say yes? 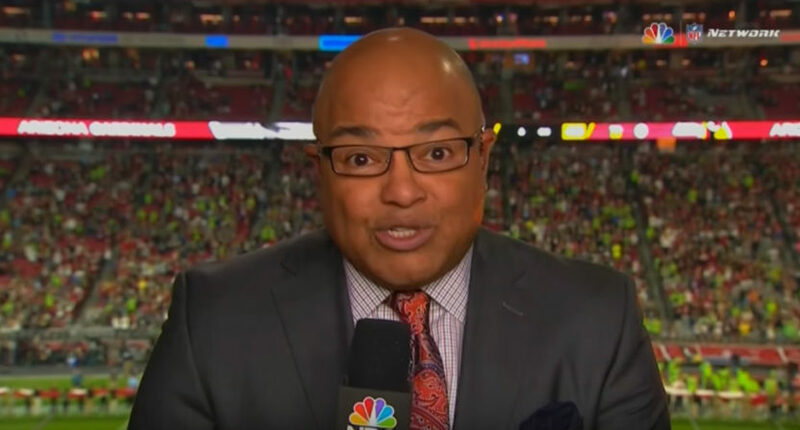 If Fox does ask for Mike Tirico for Thursday Night Football, should NBC say yes? The idea of Fox acquiring Tirico on loan from NBC for TNF is "in the first quarter," according to Andrew Marchand's sources. There’s been a whole lot of talk about Peyton Manning possibly heading to Fox for Thursday Night Football, but there’s now an intriguing twist to that involving NBC’s Mike Tirico. Andrew Marchand of the New York Post reported Wednesday that Fox might try to bring Tirico on part-time for TNF as part of their efforts to lure Manning. But the really interesting thing to contemplate there is if NBC (Tirico’s primary employer) would, or should, approve. Fox so badly wants Peyton Manning to be the lead analyst on its new $3 billion Thursday night NFL package, it is exploring the idea of luring the face of NBC Sports, Mike Tirico, as its play-by-player on the 11-game schedule to help make Manning more comfortable. “The idea is in the first quarter,” a source with knowledge said. Manning and Tirico developed a strong relationship over the years when Tirico called play-by-play on “Monday Night Football.” The two have stayed in touch even during Manning’s post-playing career. Manning is friendly with Tirico’s former “Monday Night Football” partner, Raiders coach Jon Gruden, who is a huge Tirico fan. So, maybe there’s some merit to this idea for Fox, and maybe it will help them lure Manning in. Manning certainly has options, with ESPN also reportedly targeting him (to say nothing of his many lucrative possible deals outside of broadcasting), and landing a partner he likes could be a big deal. But the big question here is if this would make any sense for NBC. On one level, yes, it absolutely would. Marchand notes that Fox could pay part of Tirico’s NBC salary if he does TNF for them, and that’s an attractive savings. And without TNF, NBC has less for Tirico to do on a week-to-week basis; yes, he can do some Notre Dame games and so on, but Al Michaels is still the main man for Sunday Night Football, and while Tirico is the heir apparent, that doesn’t mean much in the moment. Cost savings for NBC, plus keeping Tirico happier with a prominent NFL role, might add up to a worthwhile equation. It’s not like they particularly need him on Thursdays now that they don’t have that package. And it’s also not like networks can’t share announcers, as Fox and ESPN are about to do with Alex Rodriguez, and as many others have done in the past. On the other hand, this would become one of Tirico’s highest-profile gigs. (Yes, the Olympics are a bigger deal, but that’s every two years.) And it would lead to a lot of people associating him with Fox rather than NBC. Given that the plan seems more and more to make him the face of the network, replacing Bob Costas (already sliding into a smaller role) and Al Michaels (presumably planning on retirement relatively soon), it’s understandable if NBC wants strong brand identification with Tirico. And there’s at least a case that loaning him out to Fox here might hurt that. As for Fox, this might build a little resentment in the ranks from the very-qualified NFL broadcasters passed over for Tirico, and they may wind up building Tirico’s brand despite not having a long-term connection to him. Overall, though, this would probably seem to be a reasonable deal for all involved, especially if Tirico’s willing to do it without asking for more money and if Fox is willing to pay part of his NBC contract. It gives Tirico a high-profile role while he waits for Michaels to retire, it gives Fox a high-profile TNF booth (especially if it also helps them land Manning), and it gives NBC some money (and keeps Tirico happy during a period where they don’t have much for him to do). Does that overcome the disadvantages of having the soon-to-be face of their network appearing on Fox each week? Maybe, maybe not. From here, it’s worth a shot, but we’ll see what call the NBC brass make.